One of the curious things about the modern architectural world is the art of the computer renderer. A friend of mine once worked on a project where the computer renders of the building were surrounded by a carpark which contained only Lamborginis. This, despite the building being designed for lowly polytechnic students in a poor part of town, and highly unlikely to ever sight a single Lamborghini, let alone a whole paddock load of them. We’ve got a similar thing going on with the latest renders of the dreaded Basin Flyover. A previous render of the “landscaping” around the columns of the Flyover and published on the front page of the Dom produced much mirth around the country for the depiction of a earnest person tanning themselves, luxuriating in the basking light of the underpass, and seemingly stripping off in the middle of the road to get some rays. You just know some spotty faced youth, with undoubted computer skills but not enough social skills to pull said bird himself, had had his way with the render, plonking in a sheila to people the render with some people doing people things. 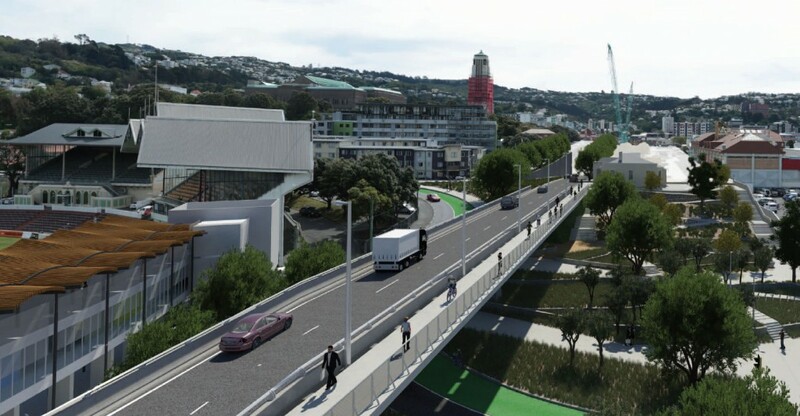 And now, with the “additional before and after” views requested by the “very important” Board of Inquiry judge heading the board, we at last have some certified true and accurate renders of the new proposed Flyover, in all it’s obtrusive hideousness, sailing across the valley 9m above our heads. And, to be honest, totally buggering up the views of the poor buggers in the Grandstand Apartments, who used to have a grandstand view of the Grandstand, but now just have a Grandstand view of the flyover instead. Still, they’re just rich buggers, and while normally rich people get special treatment in this country, here they obviously haven’t been sucking up to JonKey enough, and so they’ve been shafted. 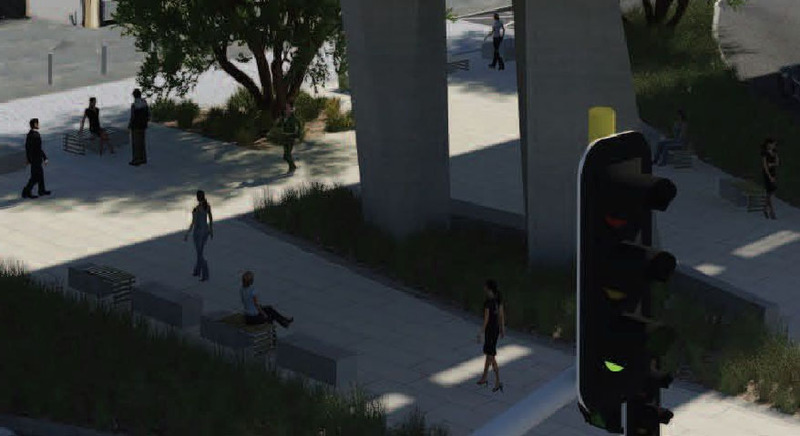 But the detail I especially like, if you look hard enough in the (now certified accurate) renders of the whole scene, is that there in the glooming, sits a poor sweet innocent young woman, once more pausing in the middle of the road to do something like sunbathing. Except, in this certified true case, her bench seat, and many square meters of carefully laid-out paving as well, is all cast in dark, gloomy, underpass shadow. Now, call me a cynical old stick in the mud type of Fish, but I’m willing to bet good money that this is a sight that we will never see in our lifetimes. Firstly, that we will probably never get to see anyone sunbathing under the underpass, and certainly not if it is a shady spot for most / all of the day, although I do grant you that underpasses provide nice dry places for recovering alcoholic / homeless / urban youth / crack addicts to live in many other parts of the world, and so we might have some sunbathing of the Ben Hanna style. But Secondly, that we will probably never see a nice young woman waiting under the underpass either, as that is just not a place that young ladies would wait, unless she was waiting for a quick pick up job. Sadly, to the much-derided rendering genius / spotty faced youth that has rendered this view, not only are the people all wrong, with their happy clustering and sunbathing and all, but also the vehicles are all wrong also. If that is the sum total of the cars crossing the Flyover, then someone has sadly done their sums wrong. We’re promised that this will be the Bridge to end all congestion. 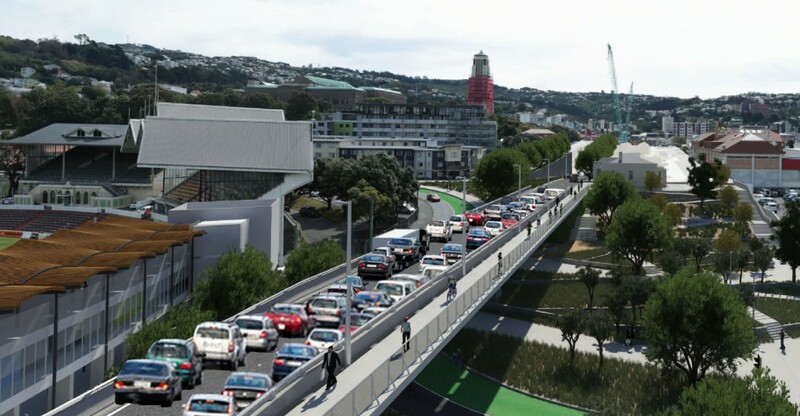 No more will cars from the Airport get clogged in traffic at the Basin, Instead they are going to be screaming across the Basin Bridge on the way for one bottle neck to the next, and the Flyover will be jam packed with thousands of cars, suspended in mid-air, not making a sound, not getting buffeted by the wind at all, and not having a care in the world as the new traffic solution will answer all their prayers. Meanwhile, a high speed, high quality public transport system whips quickly underneath them, whisking passengers along the Transport Spine route from Newtown to Centre City. But – where are the buses? Where have all the cars gone? Why are so many people still on foot? Why has the renderer got it all so Pete Tong? Won’t it be a bit more like this? No-one in their right mind will want to hangout or meet anyone near that thing. Would you say to someone now – oh yeah meet me at the Terrace Carpark, where the motorway goes over the top. Or the Interislander ferry terminal. Where the flyover will start curving round towards the Vic tunnel it will kill off any ground level connection there between Kent/Cambridge and Adelaide Rd… unless you’re in a car. Well Spotted Maximus ! This sort of art work is obviously part of the “sell job”. I absolutely agree with your point about the lack of buses too given it is already a major bus route and, for the future, the Spine Study’s draft recommendation is for Bus Rapid Transit through this area. There is indeed something rather odd about the people hanging out in your third (underpass) picture. There are 5 women, and 4 men, and they’re all just “hanging around”. I find myself wondering what on earth they are doing. 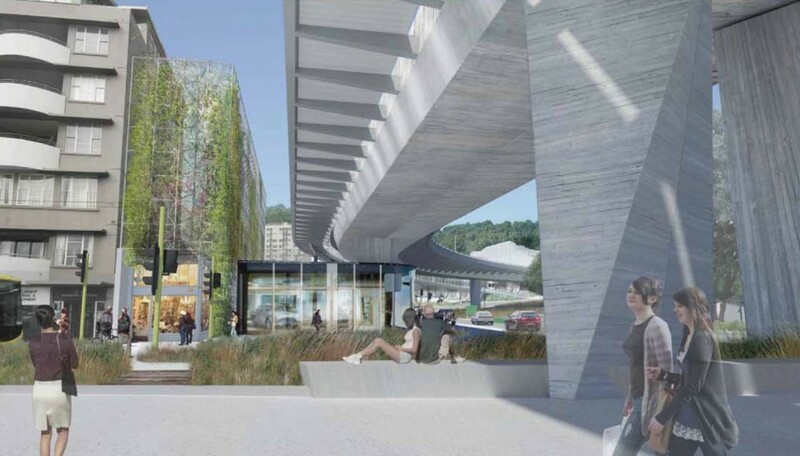 I dispute that they are sunbathing, as clearly there is no sun, but then why are they spending time in the semi-darkness, beneath the noise of the underpass, with 10,000 tonnes of concrete overhead? They’re all well dressed, with what looks like the latest style of shoes on their feet, sleek and well groomed with tight pale blue T-shirts on, so clearly they are not the school children who normally frequent this spot. I’d say too that they are not your typical cricket fans, who might more typically be wearing beige romper suits, or a pair of stubbies and a wife-beater. They don’t seem to be in a hurry to get anywhere, so they’re not likely to just be commuters – no, these people have made it their life’s occupation to sit on those comfortably designed concrete landscaping elements, and so sit there they will. I’m thinking that it is indeed more likely that they are nurturing a growing cocaine habit, and are indeed, as your much lamented former hero said, “just waiting for the man”. The Phantom may well be correct that these people have raging coke habits – have you noticed how there are no fat people in these renders? JM – nice render. Very lifelike, especially on the cars. Bit lacking on the people front…. 60 – I think Mr Saatchi lost the plot years ago. Insulting the sniffing habits of the worlds favourite buxom chef is not a vote winner in any court, but apparently he never even used to eat Nigella’s cooking, which shows that he is the one with the personality issues… And as for “holding her by the throat so that she would focus on what I was saying” – oh dear Chuck, you’re going down. And not in a good way. But yes, you’re right. The little rendered people are clearly all escapees from a New Idea school of modeling shoot, coked up to the eyeballs. Or – and this just came to me in a blinding flash – perhaps this is an undercover unit assigned to the Governor General, who so loves the new flyover that he is now walking to work every day (wherever he actually works). All these extremely buff people aimlessly milling around are actually ex-SAS members, with little transparent earpieces, and a Glock down their tight trousers, waiting for the Govna G to finish his jog round the inner circle of the Basin. Phew, solved it at last! 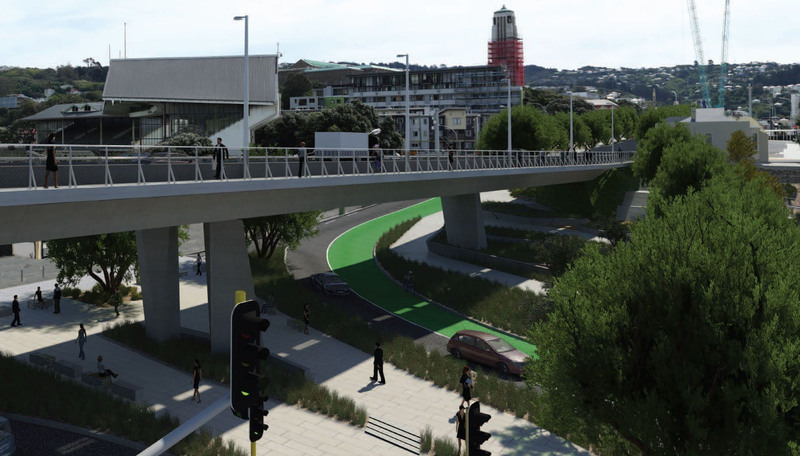 Post script – and hooray, Scoop have scooped my rerendering of the Flyover for a visual – fame at last! (do you have any idea how hard it is to find an image on google of cars driving away from you at the right angle, on the left hand side of the road? People driving towards you, no problem. People driving on the wrong side of the road, no problem. But people on Our side? No way). InnerCitySuburbanite – fair cop Guv! Unlike you, I haven’t checked out the RVs of the Grandstand apartments – I just presumed that because they were rising up above the city, and in a prime location overlooking the green swathe of the Basin Reserve, that they would be relatively pricey. They certainly seem to be a step in size above those going up on the other side of the Basin, the Nouvo block being built at present. I wonder if the fact it will have a Flyover thundering past has already been taken into account in their property values? I’d imagine that it would be pretty hard to sell an apartment there for the next couple of years…. You must be taking the piss. The Basin is the arse-end of the CBD. The only reason I’ve ever stopped in the area was to visit the Repcos, and prime locations don’t have car part mega-stores. At the moment, the Basin and vicinity hardly have any pedestrian traffic and no one (as in NO ONE) hangs out there. That won’t change because of the bypass. A row of big pohutukawa trees all the way down to the sea, if they can see that far. I’m guessing that they are actually quite nice and desirable apartments. On the contrary, all i have (and i suspect you too) are views of other buildings. Not everyone gets turned on by that…. Heavens preserve us from a broken budgie smuggler…. Max>Not taking the piss. honest ! A couple of year ago, my employer booked a visiting Aussie colleague in to a hotel way up the top end of Willis St within spitting business of the bypass. It was a grim place, surrounded by grotty buildings and traffic and with a 15 minute walk to anything useful like food or the waterfront. He was absolutely miserable there. I objected to picking him up there in the morning, on the basis that he was further away from the office than my place, and my walk to work usually involves the Waterfront or the Quays rather than light industry and a motorway exit. It is the same with the Basin or the Old Hutt Rd in Thorndon. People live in these places, but they’re ugly areas with nothing to do. It’s inner city living without any of the good things about the inner city, like cafes or Moore Wilsons or Chaffers Park. David Preece – not to forget that an underpass took Lady Diana away…. well, an underpass combined with a drunken french chauffeur and some high speed paparazzi…. we’re unlikely to have too much of that at the Basin…. …and they’re earthquake prone. Poor rich buggers.